Robyn Vilate: My favorites... Hair care edition! My favorites... 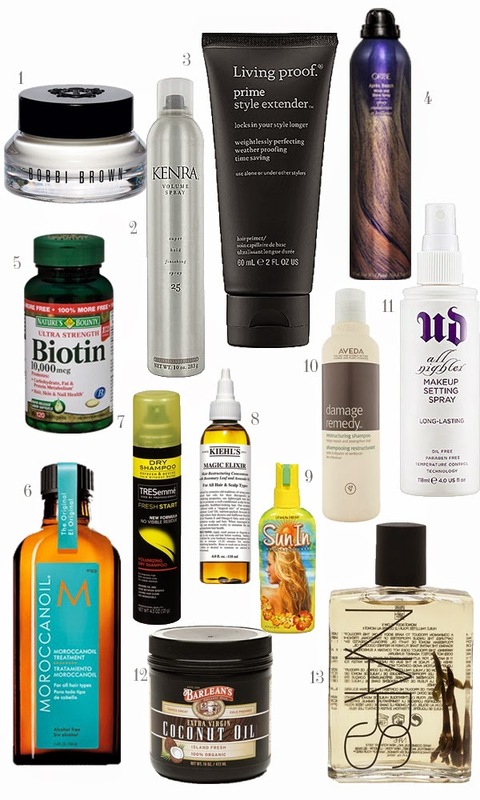 Hair care edition! The majority of these items are products I use, LOVE and highly recommend, where a few of these items are "wishlist" items that I have heard great things about and have been dying to try! 1. Bobbi Brown Eye Cream- I use this EVERY night and love it! It is one of my favorite eye creams and helps with any puffiness or dark circles. 4. Oribe Beach Wave & Shine - I had bought a few different types of beach wave spray (the cheap stuff) even after I had heard about this stuff because I couldn't quite get myself to spend the extra money for the "good stuff", but after all the other products kind of sucked and never gave me the beach waves I wanted, I finally broke down and bought the Oribe brand. I kid you not, it's worth every single penny. 5. Biotin - I take it every day. Since taking it I feel like my hair is shinier and grows faster. Nuff' said. 6. Moroccan Oil - Possibly one of my favorite hair products. This goes straight on my hair after each time I wash it, as well as anytime I feel like the ends need a little more hydration or shine! 12. Coconut Oil - There are so many amazing uses for this product that every single woman should have a bottle of this on her shelf! Not only do I use it as my cooking oil now, but I use it on my hair, skin, nails, and teeth! Truly one of the greatest products there is! As for the other items, I have heard great things about the Aveda Damage Remedy Shampoo and Conditioner as well as Kiels Magic Elixir. LOVE the all nighter spray! Have you tried the Vitamin B6 spray? I use it before applying my makeup and it's so great! LOVE the TRESsemme dry shampoo! It smells better than a lot of the other ones on the market. How do you use the Oribe spray?